Anderson Cooper anchored an expanded two hour edition of AC360 from Washington, DC on Monday night. The talk was all politics (mostly Republican) ahead of tomorrow's Super Tuesday primaries. There was an interview with the wife of "he who shall not be named" but fortunately, Anderson did find time to include news of President Obama honoring U. S. Navy SEAL Senior Chief Special Warfare Operator Ed Byers with the Medal of Honor for a civilian hostage rescue mission of a doctor in Afghanistan in 2012. Byers record includes 11 overseas deployments, 9 combat tours, 5 Bronze Stars with valor and 2 Purple Hearts. 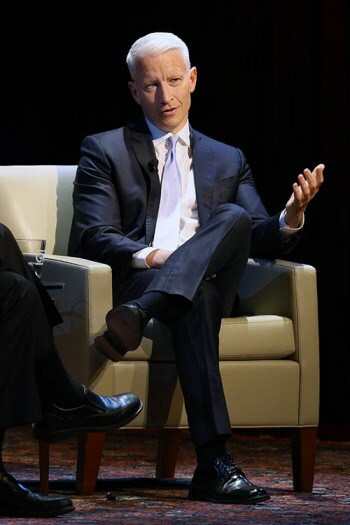 Monday, Feb. 29, 2016 8:55 p.m.
CNN anchor Anderson Cooper found himself answering questions instead of asking them Monday, when he spoke in front of a full house in Lisner Auditorium with School of Media and Public Affairs director Frank Sesno. The award-winning reporter discussed his experiences covering difficult topics in journalism and politics and his role as an openly gay media figure. The conversation touched on topics like the 2016 election, Hurricane Katrina, and wars in the Middle East, and was sponsored by SMPA and the student group Allied in Pride. Before introducing Cooper, Sesno announced a screening of the Oscar-winning film Spotlight, which won for Best Picture Sunday night. Two of the journalists depicted in the film will be present at the April 14 screening, including Marty Baron, the current executive editor of The Washington Post. Sesno also announced a $50,000 gift recently donated to SMPA by an alumnus for the Career Access Network, which officially started last semester. Cooper, who had just come from an interview with Melania Trump, the wife of presidential candidate Donald Trump, explained the challenges and merits of interviewing people with controversial viewpoints. Cooper said he prefers to confront interviewees on facts rather than differing ideological stances. He shared his experience visiting a Pizza Hut with a group of Neo-Nazis. Cooper, who came out publicly in 2012, is one of the few openly gay figures in the news media. He said there were challenges in being a gay member of the media, but that he felt he was a better journalist because of his sexuality. He said his sexuality has given him a unique vantage point of society, allowing him to better understand privilege and marginalizations than if he were straight. “I would have been a child of privilege, with all the advantages of that privilege, without perhaps much of an understanding of what discrimination is like or an understanding of what limitations are like,” Cooper said. Cooper told the audience that the massive amount of information currently available puts them in a position to educate themselves about the world better than those from past generations. He said while many refer to the days of Walter Cronkite as “the golden age of news,” that the in-depth, constant reporting by networks like his own CNN are more thorough, even if not everyone is watching the hour-long documentaries that he and others put out. Anderson stopped to take a photo with a fan on the streets of DC on Sunday. Anderson Cooper and Wolf Blitzer led CNN's Saturday night coverage of the Democratic Primary in South Carolina. Anderson moderated large panels and with results called early, there was a lot of interesting panel discussion. Anderson Cooper anchored an expanded edition AC360 from the Washington, DC Bureau on Friday night. Much of the program was devoted to Republican political coverage. There was a little Dem coverage in the second hour along with a short piece on the shooting of the day and an AC360 Bulletin. Anderson Cooper anchored an expanded two hour edition of AC360 from Houston, TX on Wednesday night ahead of the CNN Republican Debate on Thursday night. Most of the program was devoted to political news and a telephone interview with he who shall not be named that was recorded earlier in the day and edited for air! There will be a shortened AC360 on Thursday night and then Anderson will anchor a special two hour edition of AC360 post debate. With the Democratic Town Hall taking the 8pmET time slot on Tuesday night, there was no AC360. But Anderson Cooper was part of CNN's Republican Nevada Caucus Results coverage from Washington, DC. Anderson moderated the giant panel from 10pmET - 2amET. Anderson Cooper hosted the CNN Quiz Show - Race For The White House edition. Anderson Cooper anchored an expanded two hour edition of AC360 on Monday night. On Monday morning, Anderson posted the reveal of his book cover to Facebook, Instagram and Twitter. 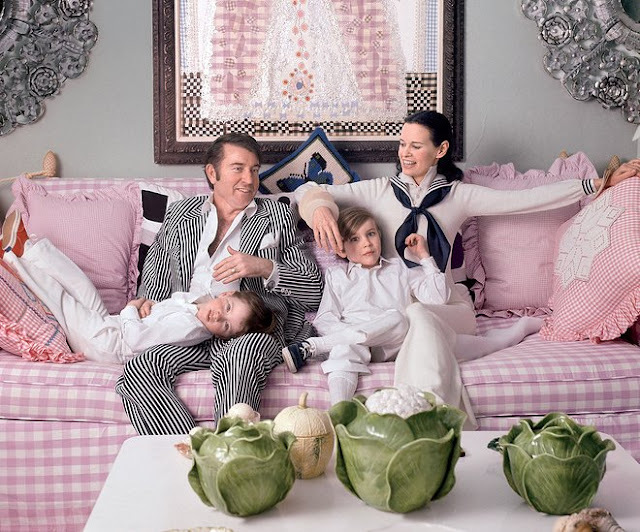 A new HBO documentary looks at the glamorous ups and devastating downs of Gloria Vanderbilt and Anderson Cooper. For decades, those boxes of pictures, letters, gewgaws, and mementos languished in storage lockers around New York, accruing fees, threatening to become lost to the vagaries of time, and basically driving Cooper crazy. “I kept thinking it would end up like that room in the last scene of Citizen Kane,” he says. Eventually he had everything shipped to his two basements, one in New York City and the other in his country house in Connecticut. Anderson Cooper is a busy man. Weeknights, he anchors his own newscast on CNN. Other times, he’s on the road, around the world, gathering material for stories. But on the rare weekend off, he can be found in one of those basements, sorting through his mother’s stuff, a determined archaeologist on an emotional dig. It’s a job that requires patience and a sense of humor. “You open a box,” he says, “and there’s a chandelier; then you open another box, and there’s a box of cornflakes from 1953.” Over time, the objects began to pull on Cooper’s imagination, drawing him deeper into the uniquely fascinating world of his mother’s past, an era that began as the great robber-baron fortunes were petering out, the Jazz Age was dimming, and the golden age of Hollywood was taking flight. Never underestimate the power of a well-connected friend. One day Cooper mentioned the idea of a documentary to Sheila Nevins, who then mentioned it to documentary filmmaker Liz Garbus, who was riding a wave of critical success for her Academy Award–nominated film on the life of Nina Simone. “At first I thought, Gloria Vanderbilt?” Garbus says. “Hasn’t that story been told?” But when she started looking deeper, she saw that, in fact, there were many chapters in Vanderbilt’s saga. For one generation of viewers, she might be the “poor little rich girl” of the 1935 headlines; for another, she was the first woman to make a fortune branding designer jeans; for yet another, she’s the mother of that openly gay, totally hot anchor on CNN. Moreover, Vanderbilt is nothing if not visual. Since she was a child, she has been relentlessly photographed by others and documented her own life in a rich and steady stream of paintings, many of which are highly autobiographical. And all those boxes that kept Cooper up at night with worries? “A treasure chest for a documentarian,” Garbus says. “Well . . . to have this genius . . . which he was, think I was extraordinary and wonderful, it just gave me a big lift,” she answers. As if that explains everything! In a way, it kind of does. Vanderbilt’s own mother was eighteen when she gave birth to Gloria. Soon after, she took off for a months-long voyage with husband Reginald Claypoole Vanderbilt, leaving their infant child to be raised by a beloved Irish nanny—Dodo, a reassuringly solid silhouette who appears again and again in Vanderbilt’s paintings. Within two years, Reginald had died, but the young Mrs. Vanderbilt’s parenting skills never improved much. Her main interests seem to have been parties, clothes, and her own beauty. “She was a narcissist,” Cooper says. “She was only eighteen,” Vanderbilt tries to defend her, though disappointment with her mother is clearly the wound that never healed. The young Gloria was essentially left to raise herself, shaped by the chimerical notions of love and romance she found in the movies. The woman who emerged from that chrysalis is like no other person in the world. She was intensely driven in every art she attempted—acting in several TV series, painting every day, writing romance novels and a few memoirs. But she was also perpetually girlish, a seeker of beauty and novelty who was rarely satisfied for long. Having been born into a bubble of fame, that is where she continued to live, expertly maneuvering its levers when it suited her purpose. When she wanted to leave Stokowski, the conductor whose reclusive ways had come to seem stultifying, she waited until a more charismatic (and more famous) lover came along. What husband could possibly compete with Frank Sinatra? Her fourth husband, the actor turned writer Wyatt Cooper (Anderson’s father), once wrote that she was “as exotic as a unicorn . . . as subtle as an Egyptian temple cat . . . as tentative as a doe in the forest.” He was in love, but you get the idea. Both then and now, there’s a reason people continue to be fascinated by Gloria Vanderbilt. Growing up, Cooper sometimes found himself wishing for a mother who was a little less fascinating. She didn’t cook; she didn’t know the quotidian details of his teenage life. There was a period when she drank too much. (Not for long; she didn’t like what it did to her face.) She traveled a lot for her work, and photographers were constantly showing up for magazine shoots; imagine Judy Garland mixed with Audrey Hepburn. She was always saying how she wished she’d had girls—“That used to drive me crazy,” he says. It became easy for Cooper to define himself as her other. She was a Vanderbilt, he was a Cooper. When he was about six years old, his father pointed out the statue of his ancestor Cornelius Vanderbilt in front of Grand Central station. After that, the young boy thought all grandparents turned to stone when they died. Much better, to his young mind, were the jovial Coopers on his father’s side, a warm, close-knit Mississippi family of farmers who were instinctively at ease with one another. After his father unexpectedly died during open-heart surgery at the age of 50, Cooper got a job as a child model. “It’s such a cheesy thing to do,” he says. “But I wanted to take care of myself. When you lose a parent at ten years old, the world seems like a much scarier place. It makes complete sense to me that I took survival courses when I was a teenager and started going to war zones as a reporter. I didn’t ever want to be taken advantage of, and I wanted to be able to take care of those around me.” Including his mother. When Vanderbilt spent five years in an affair with a married man, it was her son who repeatedly told her the truth: He’s never going to leave his wife for you. And he never did. “I should have married some really rich tycoon,” Vanderbilt says, sighing, when asked why she never remarried. “I would have been all for that,” Cooper says. As the words began to flow (and flow and flow), Cooper began to realize how little he actually knew about his mother’s past. Why didn’t she talk to her mother for seventeen years? Why did she abandon Dodo, the nanny who had been like a surrogate mother, to die alone, a ward of Catholic Charities? Despite all the sadness and regrets, he saw that something in her was able to survive, and even to flourish, just as he had. It turns out they are both driven, restless, and determined. Instead of wishing his mother had been more conventional, he saw how her iconoclasm had shaped him in ways that have served him well. She thought nothing of taking him with her to parties and nightclubs like Studio 54. Her famous friends—Charlie Chaplin, Isak Dinesen, Truman Capote—were as unremarkable as the wallpaper for him, all good training for journalism, a job that requires confidence in whatever room you enter. Garbus’s film brilliantly mixes Vanderbilt’s own surprisingly good art (an exhibition at 1stdibs Gallery at 200 Lex is scheduled to coincide with its release) with vintage newsreels and homemade videos shot by Cooper himself, but the moment of truth comes at the end, when the two of them go to visit the graves of Wyatt and Carter Cooper, Anderson’s older brother, who committed suicide at 23. In that naked moment of vulnerability, as mother and son hold hands at the snowy grave, you also see another truth about the wildly successful Gloria Vanderbilt and her celebrated son Anderson Cooper—they never would have made it without each other. For the original article, please click on above link. Anderson Cooper anchored an abbreviated edition of AC360 from Columbia, SC ahead of moderating night two of the CNN GOP Town Hall. He made a short appearance on Erin Burnett's Out Front, anchored the abbreviated edition of AC360, moderated the town hall and spoke to Don Lemon for a few minutes after the town hall wrapped up. Anderson Cooper was in Greenville, S.C. tonight to host the first to two GOP Town Halls. The second will be tomorrow (Thursday) night. He joined Erin Burnett on Out Front and then hosted about a 10 minute edition of AC360 before the Town Hall began. Anderson Cooper anchored AC360 at 8pmET. Politics, politics and more politics with an AC360 Bulletin thrown in at the end.